To find your hat size, measure around your head where a hat would sit (normally about 1/2"- -1" above the eyebrows and ears). Remember to hold the tape measure comfortably since most measuring errors occur by applying the tape too tightly. You can also use a non-stretch string and measure it afterwards. 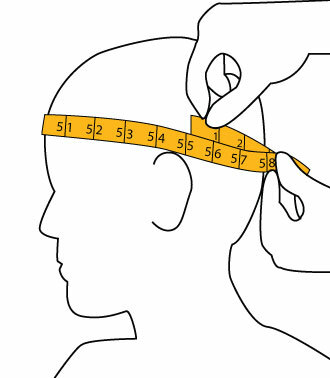 Measure to the nearest 1/8" and find your applicable size on the chart below. If your measurement puts you between two sizes, it is generally better to order the larger of the two. And if for whatever reason the hat doesn't fit, we'll happily exchange it for one that does with no restocking fee!